Last month, the Austin City Council passed a new Paid Sick Leave Ordinance—the first of its kind in the south. The Council voted 9-2 to implement the policy in the early hours of February 16, 2018. The ordinance applies to private-sector employers located in Austin, Texas, and requires employers to provide paid sick leave (PSL) to employees beginning October 1, 2018. Hours after the measure was passed, several state legislators announced they would challenge the ordinance saying it would hurt small businesses. According to reports, a number of lawmakers in both the House and the Senate say they will support legislation overturning the ordinance in the next session. The next regular legislative session begins on January 8, 2019, so while local businesses will have to keep an eye on any such legislation, most employers must begin implementation of the new PSL regulation and allow employees to start accruing sick leave on October 1 of this year. The following information provides details about the new ordinance as well as answers to some frequently asked questions about the policy. Employers and employees in the city of Austin are covered by the PSL ordinance. A covered “employee” is defined as a person who performs at least 80 hours of work in a calendar year for an employer. It does not include independent contractors or unpaid interns. The ordinance defines “employer” as “any person, company, corporation, firm, partnership, labor organization, non-profit organization or association” that pays an employee to perform work and exercises control over the employee’s wages, hours, and working conditions. It does not include state or federal governmental employers. For employers with 6 or more employees, the ordinance becomes effective on October 1, 2018. For employers with 5 or less employees, the ordinance becomes effective on October 1, 2020. How Is PSL Earned and When Can It Be Used? Sick time will accrue in 1-hour increments and employees will earn 1 hour of sick time for every 30 hours worked. PSL will be available for an employee to use as soon as it is accrued. 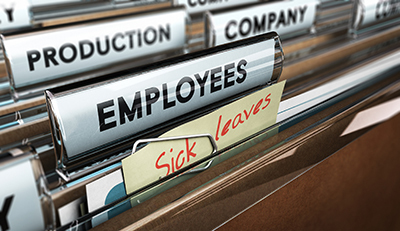 However, employers may restrict an employee from using earned sick time during the employee’s first 60 days of employment—but only on the condition that the employee has a term of employment for at least 1 year. PSL will begin accruing on October 1, 2018 or upon the commencement of employment, whichever is later. Although employees can carry over all earned and unused PSL to the following year, for employers who decide to lump sum grant the maximum amount of PSL at the beginning of a year, carry over is not required. Employers do not have to provide more than the applicable yearly cap of sick leave in any year to an employee (e.g., 8 days or 6 days). Employees who are rehired within 6 months by the same employer must have their prior earned sick time reinstated. For What Reasons Can an Employee Use PSL? Time off for the employee to seek medical attention, seek relocation, obtain services from a victim services organization, or participate in legal or court ordered action related to an incident of victimization from domestic abuse, sexual assault, or stalking involving the employee or employee’s family member. What Notice Must Employees Give Employers to Request PSL? To use earned sick leave, employees are required to make a “timely request” before their scheduled work time. However, the ordinance provides that exceptions to the notice requirement may have to be made when unforeseen circumstances occur. Employers may not require an employee to find a replacement to cover the hours of earned sick time as a condition of using earned sick time. What are the Recordkeeping and Notice Requirements? Monthly Statement—Employers must provide each employee with a monthly statement (electronically or in writing) showing the amount of the employee’s available earned sick time. Maintain Records—Employer must keep records establishing the amount of earned sick time accrued and used by each employee. Handbook Notice—If the employer provides employee handbooks, it must include a notice to employees about their rights and remedies under the ordinance in the handbook. Mandatory Poster—After the City of Austin develops and releases the new PSL poster, employers must display it in English and Spanish in a conspicuous place where other notices are customarily posted in the workplace. No posting is required until the official poster is released. Retaliation against employees is prohibited under the ordinance. Employers may not transfer, demote, discharge, suspend, reduce hours, or directly threaten these actions against an employee for requesting or using earned sick time, or for reporting a violation or participating in an administrative proceeding related to the PSL regulations. Who Is in Charge of Enforcement? The City of Austin Equal Employment Opportunity and Fair Housing Office (EEO/FHO) is responsible for enforcing the ordinance. Failure to comply with the PSL requirements carries a penalty of up to $500 for each violation. The EEO/FHO has the option to extend a 10 day grace period for an employer to voluntarily comply with the ordinance before imposing a civil penalty. As Austin becomes the first city in the southern states to pass a paid sick leave law, it joins several other cities across the nation that already have such an ordinance. As mentioned, it is possible that the ordinance could be challenged legislatively or in court and may be delayed or even over-turned. Whether the ordinance will survive, only time will tell. But in the meantime, employers should review the compliance requirements set forth in the new ordinance, including the new notice and recordkeeping obligations. Update payrolls systems and make the necessary changes to begin offering paid sick leave to covered employees, beginning October 1. To read the complete text of the new ordinance, click here.